That phrase is on my business card and people ask what this means. It means that I have lived my life immersed in the arts. The first $5 I ever earned was in an “Easter Coloring Contest.” I was 5. I came in second to a 3 year old that I guess won on the “cute factor.” I still remember being incensed half a century later. Pretty funny, huh? So, I guess I’ve always been somewhat opinionated, as well….. Everyone’s a critic, eh? My first career was as a performing artist and teacher. I grew up seriously studying classical ballet, jazz, modern, and even tap – dramatics, too. I danced professionally in Houston for a number of modern companies, including Farrell Dyde Dance Theatre. I played percussion in a post-modern electronica band called Supper’s Ready. It was the 80’s. That’s me on the left…. Miller Theater in Houston, circa 1984. When I determined that it was time to get my university education, if I ever was to hope to get one, it wouldn’t be in dance. I had already worked for all the major choreographers that were heading the university departments in Texas at the time. It seemed redundant. Also, a dancer’s life is short, and opening a studio wasn’t for me. No offense, but stage mothers scare me. The way it is for other people and clowns. No, my destiny was in the visual arts. I ended up in Jewelry 101 because Ceramics 101 was full. My first prof was Sandie Zilker. She was great. She gave me a wonderful foundation and the seeds of knowledge that would be my life’s blood for the next 20 odd years. I spent the late 80’s studying art at The University of Houston. I studied under Val Link and was honored with the Flaxman Scholarship “for meritorious achievement” in my area of study. Val was a fantastic teacher. He taught immaculate technique and craftsmanship. Innovation and aesthetics were expected, but he never imposed his own notions – never interfered with individual vision that wasn’t necessarily his own. A true scholar and gentleman. I emerged unscathed with a BFA. 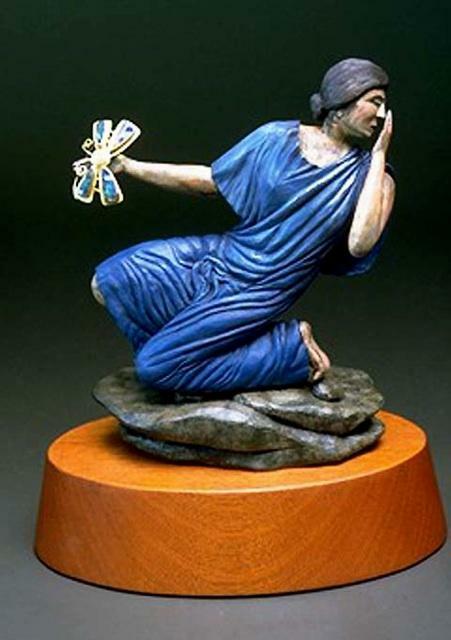 One of the collaborative sculptural pieces. 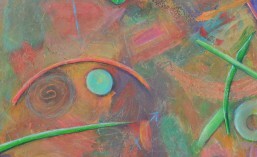 “Psyche” – Circa 2003. Meanwhile, I had hooked up with a very talented craftsman on his own path to find his life’s work in himself. This person is Charles Kegley and we collaborated in our life and work for more than 25 years. What great adventures we had. We traveled all over the US exhibiting our work everywhere you could possibly imagine. Ah, the stories….. but not here. Ultimately, we worked during the fine craft explosion of the Late 20th Century with the best, brightest, and most interesting as our peers. They were also the best cooks – more stories for another time. We exhibited and sold our works in some of the best galleries across the country as well as ending up in some significant collections. From Dr. Irving Lipton’s collection we ended up in the LACMA. From the collection of Fleur and Charles Bresler, we ended up in the Renwick Gallery of the Smithsonian. We had work in the White House while the Clintons were there. That’s just a few. That’s cool. This is an amazing ring. 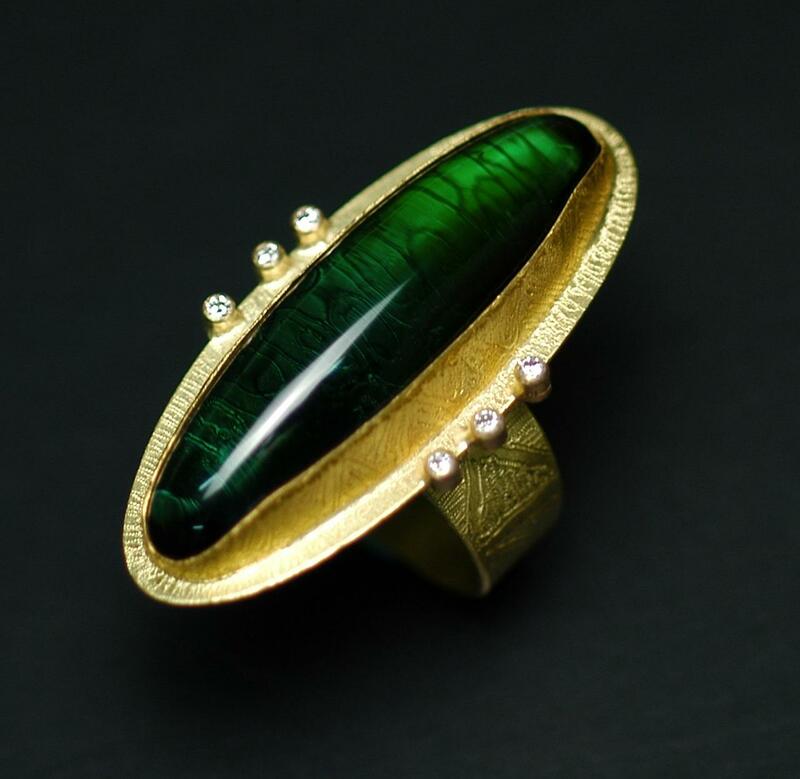 The tourmaline is essentially flawless. And huge. There came a time when we grew weary from travel. It had, quite honestly, become a grind. We moved to a lil ol’ bitty pissant country place… no, wait. Those are the lyrics from “Best Little Whorehouse.” It was actually Boerne. That was great fun for awhile – after a fashion. Ended up working with the Cibolo Arts Council and a like minded group of folk who thought the nascent art scene in Boerne could be more. Did a really nifty art and music festival for four years there on the Main Platz and at Ye Kendall Inn. Inaugurated the “Second Saturday” movement. Brought fotoseptiembre to town for a while. It all had tremendous potential. 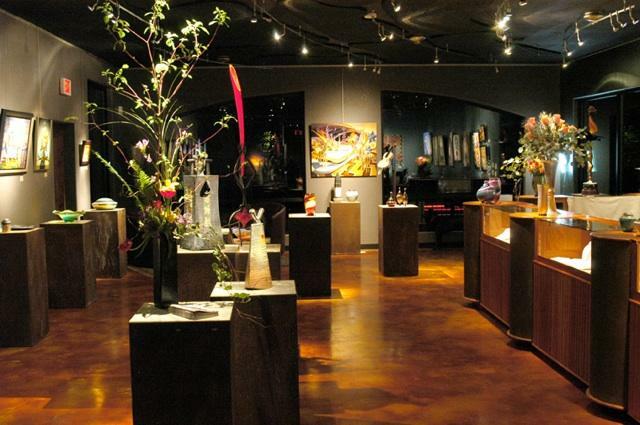 We opened the premiere contemporary art gallery in the Hill Country, Bella Creo. Alas, it all crashed and burned along with the rest of the economy and AIG. We had clients coming in to see us in tears. No more art for them. Oh well. Next. This is when I exited the world of art. I was pretty sure that the door was shut tight and I would not be going back to that fanciful, enigmatic land ever again. Can you imagine? What would I do? A good friend suggested that I would be a GREAT barkeep. And so I was. What an interesting time this was. Having lost everything, I worked very hard and long. I ultimately became the GM at The Fredericksburg Brewing Company. This was an experience that came my way due to the fact that I had worked for one of the owners in a time and place long ago and far away – The Boardwalk Gallery Goldsmiths. Funny how who you are has a way of turning up ….. Two of my very favorite people brew the beer in Fredericksburg – Rick Green and Alton Heubner. True artists and craftsmen. And then that came to an end, too. During this time, I took care of my mom at the end of her life. After mom passed, I found myself adrift. Not sure what I wanted to do with this life. I had been leading a pretty driven existence to this point. Fast, fast, fast. I decided to just stop. 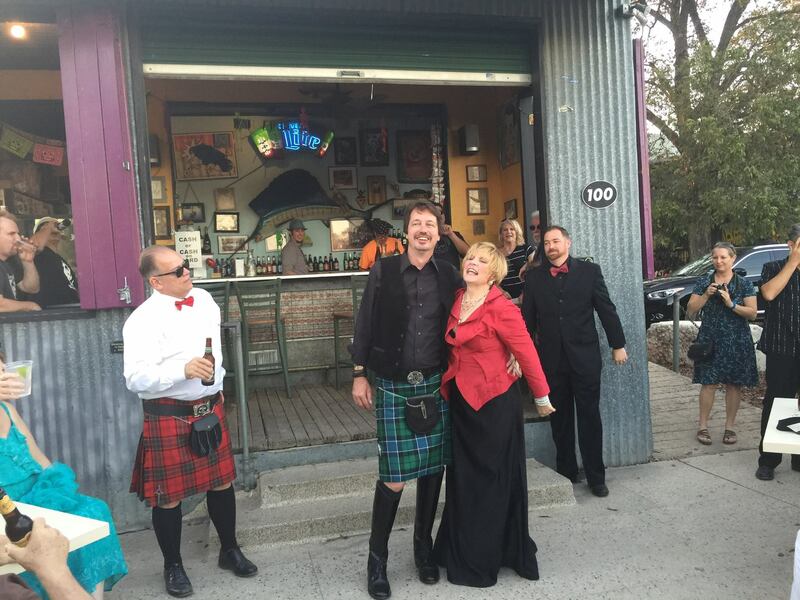 Tying the knot at La Tuna, October 2014. Today, I live in San Antonio. A million miles from Boerne. And I am truly excited by this. While living in Boerne, I will admit that I had taken this city for granted. Now, I find myself enlivened. I have found my tribe and it is a constant discovery. The art community here is alive and thriving and I love being a part of it, along with my husband, Page Graham. Since originating this blog with Page, I have had the pleasure of writing for one of the premier news sources in the city, The Rivard Report for several years. I also regularly contributed to KLRN Arts on our local PBS station (yes, Asia Ciaravino, David Bibbs and I did have way too much fun). I still contribute stories to the quarterly publication Out In SA. Also with Page’s help, I once again have my studio in place and have begun to create. For Spring 2017, I look forward to showing two very different collections of work – one at Kathleen Sommers in Monte Vista and the other at Alejandro Sifuentes’ Equinox Gallery in La Villita. Stay tuned! Alas, I don’t spend nearly enough time on this blog. We are keeping it live, but I’ll beg your patience, and ask you to understand that things don’t change much here. Those in the know will concur that there just aren’t enough hours in the day. I have started another blog to comment more directly about my jewelry which you can find here. Now you know a bit more about me and where I am coming from. Thanks for taking the time to check us out. So happy to see the new journey unfolding on your art…life..style path. Good to see your work here and meet up with you at another SA art event. Have some photos for you too. It was great to see you too! Look forward to seeing you more out and about! So delighted to read your blog and be able to catch up a bit. I have such great memories of you and Charles… and your marvelous laugh.